An entry-level offering from Bodega Benegas, Ataliva is made with 100% Malbec grapes sourced from the Upper bank of the Mendoza River and from Tupungato’s Uco Valley. Aged in French oak barrels (2nd and 3rd use) for about 6 months. 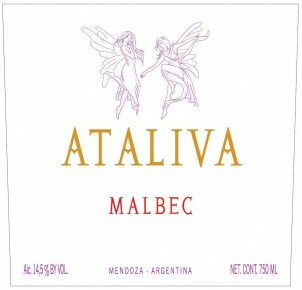 At 14.5% Ataliva is a big wine and there is enough structure to balance the fruit and ripeness and subtle earthy elements lend a welcome savory aspect. Enjoy with grilled meat and BBQ. In 1852, Jose Segundo Roca, the leader of the South American Independence, almost died after a snowstorm while he was crossing the Andes. The Indian chief Ataliva saved his life providing him with his poncho and food. This wine pays tribute to the union of both cultures, Creole and Indian. Aged in French oak barrels (2nd and 3rd use) for about 6 months.